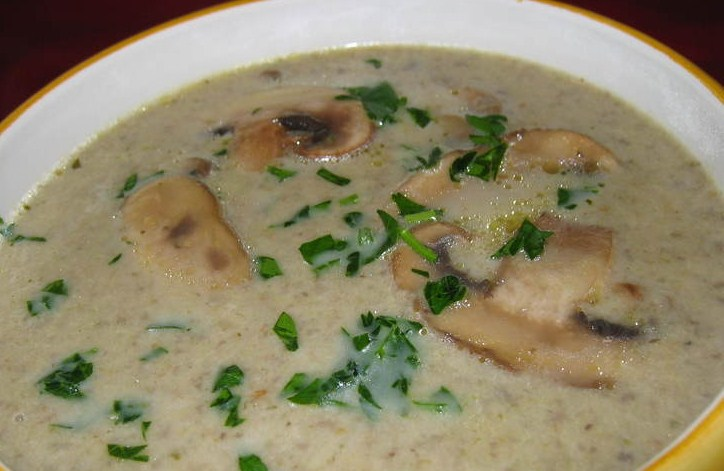 Enjoy the versatile Mushrooms in this lighter version of classic soup. First make Vegetable stoke-in a large bowl,add 3 cups of water,add all vegetables(cabbage,cauliflower,carrot & peas),salt & ginger-garlic paste,bring to boil for 10 min.strain it & keep aside. Take a large pan,add butter,when it melts add onion & fry it for 5 min. Now add mushrooms & potato & again fry it for 5 min. Now add vegetable stock & milk & simmer it for 15min. Finally add blended coriander & season it for a minute & then serve it. Soup can be garnish with coriander leaves before serve it.